Palestinian militant Abu Abbas, mastermind of the 1985 Achille Lauro cruise ship hijacking, has died in US custody, US officials have confirmed. 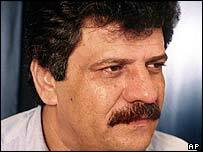 Abbas, leader of the Palestinian Liberation Front, apparently died of natural causes, officials said. 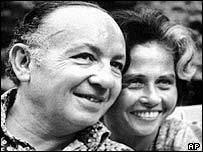 He was convicted in absentia by an Italian court for the attack, in which wheelchair-bound American tourist Leon Klinghoffer was killed. Abbas was captured in Baghdad last year by US special forces. Pentagon officials said that Abbas, who was in his mid-50s, had died on Monday, most likely of a heart attack. They said an autopsy would be performed to determine the cause of death. The BBC's Nick Childs at the Pentagon says that as the leader of the Palestine Liberation Front, Abbas could have had information that could have been of interest to the United States in its so-called global war on terrorism. During the two-day stand-off the gunmen killed Klinghoffer, an elderly US Jew confined to a wheelchair, and threw his body overboard. Klinghoffer's family said on Tuesday that Abbas' death had robbed them of justice for the killing. "The one consolation for us is that Abu Abbas died in captivity, not as a free man," a statement from the family said, as quoted by French news agency AFP. Abbas' co-conspirators were sentenced to long prison terms, but he himself was freed by the Italian authorities, who said they had insufficient evidence to detain him. In 1996, he described the killing of Klinghoffer as a mistake. "Palestinian officials believe he died of a heart attack or a stroke"